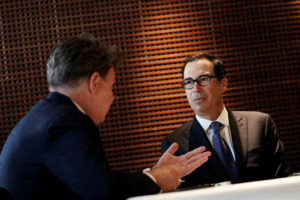 BUENOS AIRES, Argentina — U.S. Treasury Secretary Steven Mnuchin said Saturday that the overall U.S. economy has not been harmed by the trade battles set off by President Donald Trump’s get-tough policies although some individual sectors have been hurt. He said the administration was exploring ways to help farmers and other specific industries that have been affected. U.S. Treasury Secretary Steven Mnuchin said the administration was exploring ways to help farmers and other specific industries that have been affected by trade battles. READ NEXT: The trade battle with China keeps escalating. What’s at stake for the U.S.?